They’re the defining moments in military history. Decisive engagements that obliterated the past in a single, bold stroke and gave instantaneous shape to the future. And Military Heritage covers them all. And I’d like you to be among those to see this truly exceptional magazine. Every mint-edition copy of Military Heritage comes at no risk to you. No obligation, no commitment to continue. 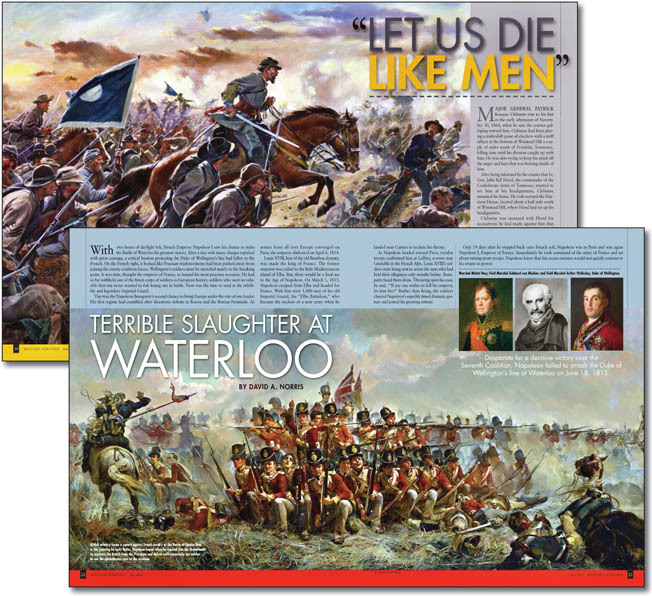 Yet it’s my hunch that once you see Military Heritage—and enjoy seeing what a military history magazine can be like—you’ll not only be glad that your first issue is in your hands, but you’ll be anxious scanning the mail for the arrival of the next issue. What can you expect in the pages of Military Heritage? For starters, the unexpected. Because each and every issue will be handsome enough to grace the coffee table in your living room or office. Printed on thick, glossy paper, like the finest art and photography magazines. And perfect-bound, not stapled, with a flat, book-like spine that’ll make it easy to shelve and catalog your growing collection. Why go to such expense? As one look at your average magazine will tell you, you can’t print high-quality artwork on low-quality paper. It simply won’t hold the color, let alone a line. And the images will never pop off the page. 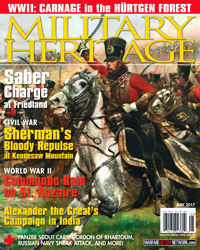 But Military Heritage Magazine has long been a premiere source of spectacular illustrations and photography, drawn from the world’s preeminent museums and archives, including: the Imperial War Museum and the National Army Museum in London; the Musee de l’Armee and the Louvre in Paris; the National Archives; the Smithsonian Institution; the U.S. Marine Corps and Army Museums; and the Australian War Memorial. The articles, of course, are getting equal attention; Military Heritage is a forum for many of today’s most highly respected military historians. In their company you’ll revisit the Civil War and refight World War II. Side with Caesar at the pivotal battle of Alesia. Take the measure of Napoleon. Re-examine the Crusades in the light of modern scholarship. Go eyeball to monocle with Bismarck and Teddy Roosevelt. Probe the shadows of sabotage and subversion. And relive such neglected aspects of military history as the Indian Wars of colonial America. Strategy and Tactics — Find out who did what and why and when. Analyze the strokes of genius and stupendous blunders that carried or lost the day. And consider what might have been, had fate taken another course. Profiles of Courage — Meet the leaders who called the shots at history’s high points. Discover the flesh-and-blood men beneath the epaulets. And ti-toe the thin line that separates hell-bent recklessness from heroism, vanity from valor, bulldog tenacity from outright bravery. Eyewitness — Here are excerpts from diaries, letters and memoirs that reveal the human side of warfare. Personal interviews that offer insights into what life was like on the battle lines. And firsthand accounts that capture the real-life drama of battles ancient and modern. Weaponry — Period photographs, color illustrations and detailed diagrams let you chart the development of the technology of war. We give you a hands-on look at everything from crossbows and catapults to cruise missiles and depleted-uranium tank-killers. You can also look forward to penetrating reviews of new works of military history and appreciative second looks at rediscovered classics. You won’t find a more true-to-life accounting of men at war than Military Heritage. 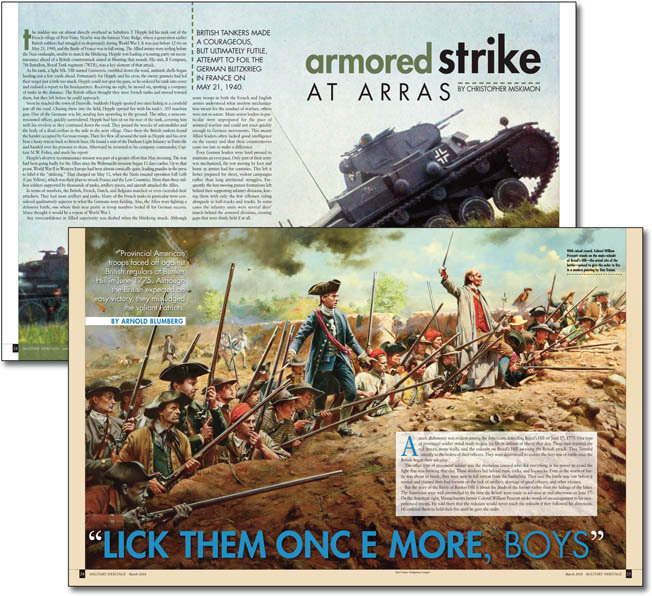 There isn’t a more insightful or more handsomely illustrated military history magazine. And between you and me, if you got any closer to the action you’d be wearing powder burns. The best part is that there’s no risk. Our no-questions-asked, life-of-your-subscription, money-back-guarantee ensures that. And you are under no obligation of any kind. 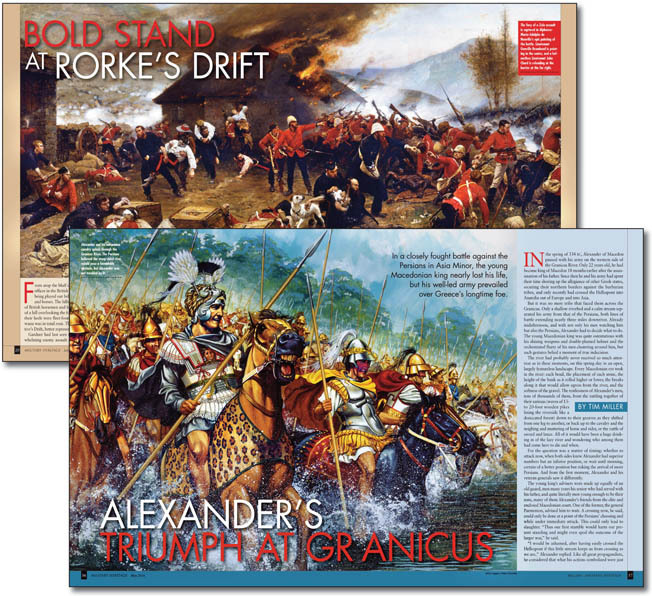 So go ahead: put yourself in the front ranks of military history magazines by becoming a subscriber to Military Heritage. P.S. Our beautiful magazine also comes in a digital edition, so choose for yourself how you want to enjoy your subscription.